"I'm going to be all right." MPAA Rating: PG-13 for violence, language, adult situations. James Spader stars as Professor Daniel Jackson, a soft-spoken, bespectacled, down-on-his-luck linguist brought in by the US government to assist with an ancient puzzle. He succeeds in decoding the hieroglyphics that unlock the Stargate, a pathway to a planet on the other side of the galaxy, and accompanies the ensuing military reconnaissance mission headed by Colonel Jack O'Neil (Kurt Russell). They discover a world where humans have been "imported" and enslaved by an alien being claiming to be Ra, the ancient Egyptian god, who rules with all the deadly technology at his disposal. The visitors inspire a rebellion when they reveal the unearthly-looking Anubis warriors to be humans in sophisticated electromechanical armor—the slave society finds its strength and earns its freedom, and Professor Jackson discovers love and a life worth living along the way. Roland Emmerich's direction is conventional but respectable—the story moves along briskly with few dead spots. David Arnold's richly orchestral score occasionally sounds generic but provides appropriate bombast as well as subtle emotional accents. The special effects in Stargate are impressive by 1994 standards, with solid model and CGI work, and the intricate costume and set designs firmly establish the film's world, evolved from (but not identical to) Earth's ancient Egypt. Aside from some unconvincing creatures, the effects are technically well executed and artistically attractive, contributing to the story without calling undue attention to themselves. The soul of Stargate lies in its characters. Though the script relies on character archetypes rather than detailed development, Emmerich allows room for each to develop into a real person. Russell's military man is brave and true, but troubled, and Spader's linguist visibly and credibly matures as a person during the course of the film. Even the non-English speaking characters like the slave leader's son, Jackson's eventual wife Sha'uri and the alien overlord have clear motivations and personality traits. And minor characters are well cast, with Viveca Lindfors and French Stewart in small but memorable roles. Stargate is not a masterpiece, but it stands up to repeated viewing due to the richness of its setting and naturalistic characters. The story is predictable even on first viewing, with echoes of recycled Star Trek and a touch of The Wizard of Oz, but the sci-fi trappings are secondary to the interesting, universal human story explored here. Image Transfer Review: Artisan has preserved the film's 2.35:1 original aspect ratio, but appears to have skimped on the non-anamorphic video transfer. Edge enhancement and moire patterns are apparent in many shots, and thin, bright horizontal edges are almost always poorly rendered, with a great deal of flickering and rippling. My overall impression was that the "bit budget" was not sufficiently allocated to the video image—there appear to be TWO complete versions of the two-hour film crammed onto this single-sided dual-layer DVD, with no "seamless branching" techniques employed for space efficiency. Color accuracy and black level are solid, but I found the compression artifacts VERY distracting from the opening credits through the entire movie. 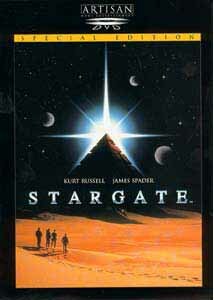 Audio Transfer Review: Stargate was theatrically released in DTS, converted to Dolby Digital 5.1 for this DVD edition. The soundtrack is big and enveloping, with lots of split surround activity. I did find myself adjusting the volume from time to time—the battle scenes are grandly scaled and loud, making a few of the dialogue scenes too quiet by comparison for comfortable home theatre listening. But it's a very solid soundtrack—bass is used both subtly and dramatically, music is clean and well balanced among all four left/right speakers, and sound effects take over the room with authoritative abandon. Great stuff here, transferred from the original digital source with no muddiness or hiss. Artisan has included a set of well-written, comprehensive biographies and filmographies, with extra credit for sheer breadth of coverage. Information is provided for 8 cast members (Kurt Russell, James Spader, Jaye Davidson, John Diehl, French Stewart, Christopher Fields, Derek Webster and Mili Avital) and 5 of the film's producers (Roland Emmerich, Dean Devlin, Mario Kassar, Joel B. Michaels, and Oliver Eberle). The disc includes the original Teaser and Theatrical trailers, both presented in 1.85:1 aspect ratio with Dolby 2.0 surround sound. The video transfers on these trailers are better than those of the main attraction, though the sound is limited by the 2.0 format. Stargate succeeds where many special-effects-laden pictures fail because it respects its human elements. The film is really a story of self-discovery and friendship disguised as an epic science-fiction movie, and the excellent design doesn't overpower the underlying substance. The DVD is seriously compromised by a below-average video transfer, but the expanded special edition content and solid supplements make this a valuable disc for Stargate fans.